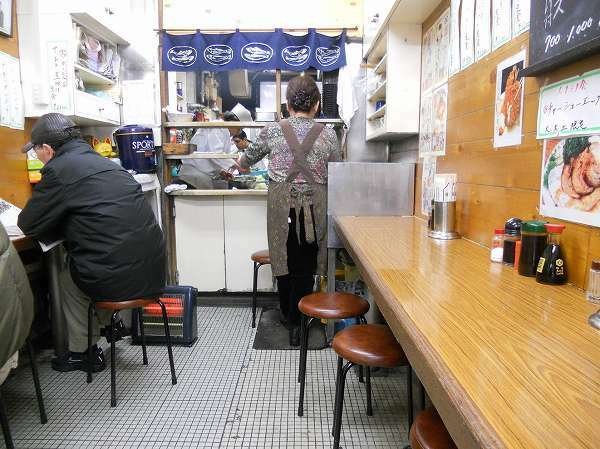 When I was an A&R man working at one of the major record labels in 90's, we would use a famous recording studio close to Tsukiji Fish Market for recording and record until early in the morning. (musicians are night people as you can imagine) After work, we would always go eat breakfast(?) at Tsukiji Fish Market. There were 5 restaurants we would go to and TOKANTSU YACHIYO was one of them. 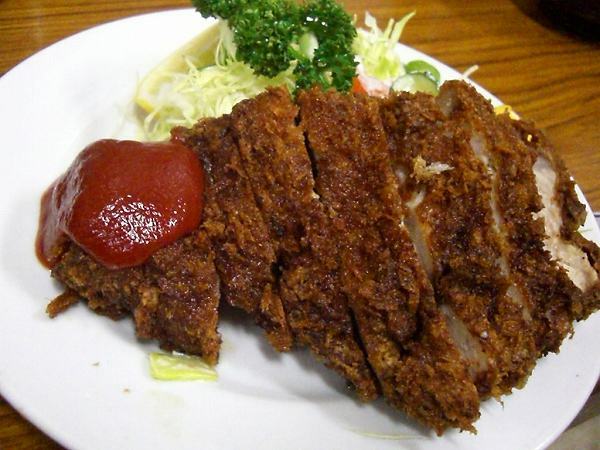 From its name, you might think that Tonkatsu Yachiyo (usually just called Yachiyo) signature dish is Tonakatsu (deep fried pork), but its actually known for its deep fried seafood. 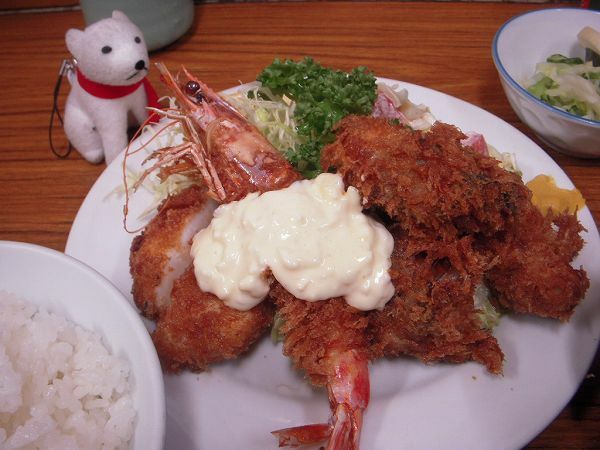 There are over 20 mixed combinations of these deep fried dishes, but you would always want a Kuruma Ebi (Prawn) or Dai Kuruma Ebi (Large Prawn) in the dish you are going to order. 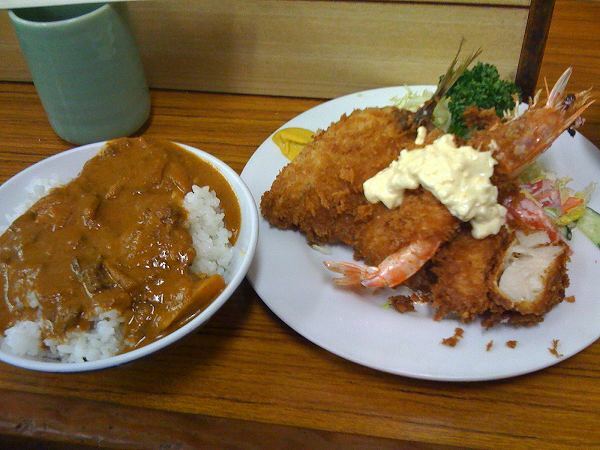 There is KURUMA EMI, KAKI, HOTATE FURAI TEISHOKU (Deep Fried Prawn, Oysters, Scallop with Rice & Miso Soup) for 1500 yen. Unlike other shops all fishes including prawns are from Japan. 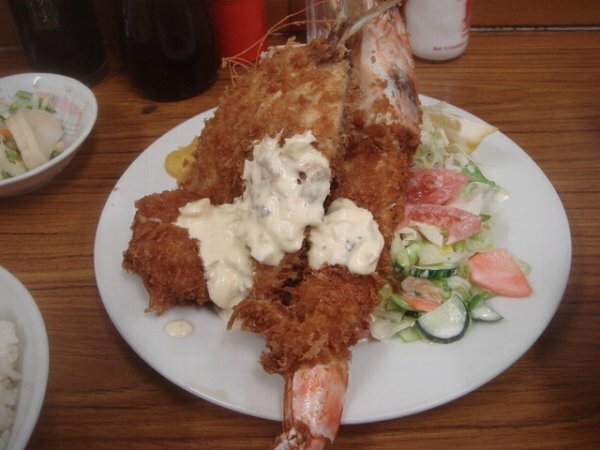 (usually prawns are from southeast asia) It is cooked extra crispy and fishes are fully cooked, but scallop, oyster and prawn are cooked medium rare inside to keep it juicy. 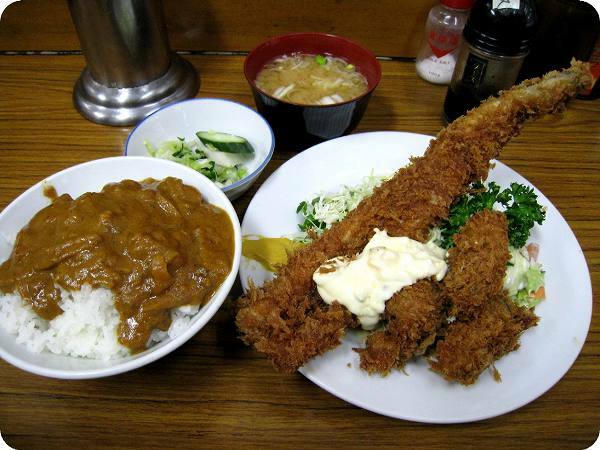 Other dishes are KURUMA EMI, AJI, HOTATE FURAI TEISHOKU (Deep Fried Prawn, Horse Mackerel, Scallop with Rice & Miso Soup) for 1500 yen, Add for an extra 100 yen, you can add curry over your rice like in the picture. or if you want to have other seafood with the large prawn there is DAI KURUMA EMI ,AJI, HOTATE FURAI TEISHOKU (Deep Fried Large Prawn, Horse Mackerel, Scallop with Rice & Miso Soup) for 2800 yen, which is my favorite since the large prawn is the best I ever had and consider by many the best in Tokyo. 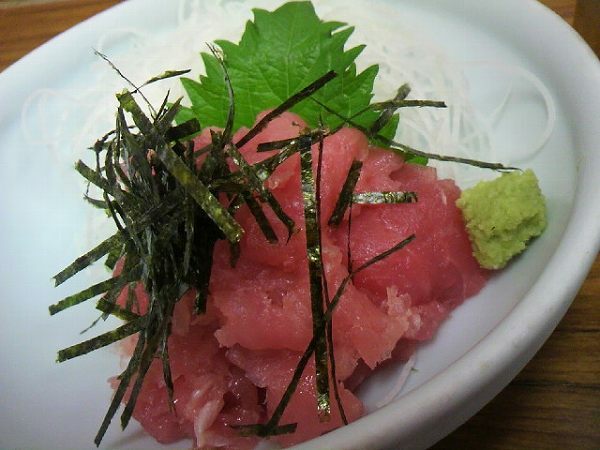 or if you want to eat sashimi since you came to Tsukiji Fish Market, there is NAKAOCHI SASHIMI, NITSUKE TEISHOKU (Tuna Sashimi, Sake simmered fish of the day with Rice & Miso Soup) 1100 yen. If you are with someone who can't eat any seafood, there is the regular ROSUKATSU TEISHOKU (Pork Loin Tonkatsu with Rice & Miso Soup) for 1400 yen, but their tonakatsu is average and over cooked in my opinion. 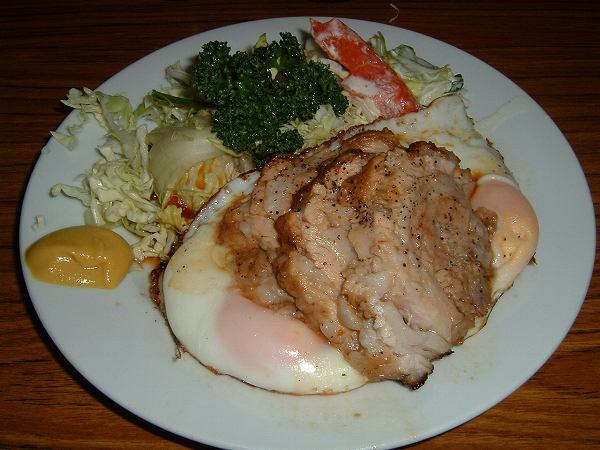 And if you are really lucky and just happen to visit on either Tuesday, Wednesday, or Saturday before 8am, their non deep fried signature dish, CHASHU EGG TEISHOKU (Roast/Boiled Pork & Sunny Side Up Eggs with Rice & Miso Soup) for 1200 yen. This dish has been introduced by so many gourmet programs on TV in the last couple of years that its sold out before 8am. Tourists who come for this usually have no idea that Yachiyo is better known for its deep fried seafood than Chashu Egg. 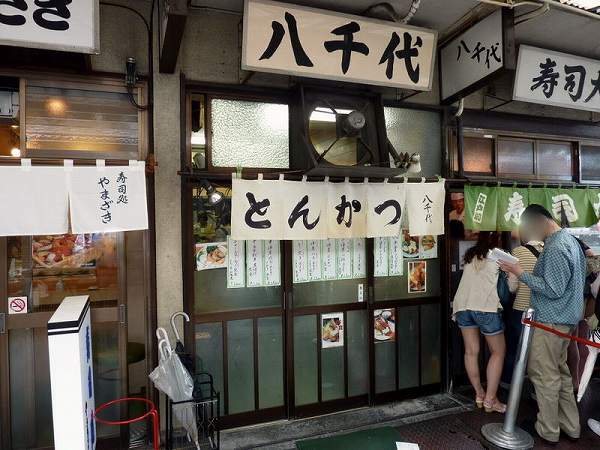 Yachiyo is a small restaurant with only 10 counter seats and not like all restaurants inside Tsukiji Fish Market, you are there to just eat, not to have a relaxing meal. Try not to talk much with your friends or family, just eat and go. Its located right next to the famous Sushi Dai, where there will be an enormous line of people waiting to eat there, so you can't miss it. 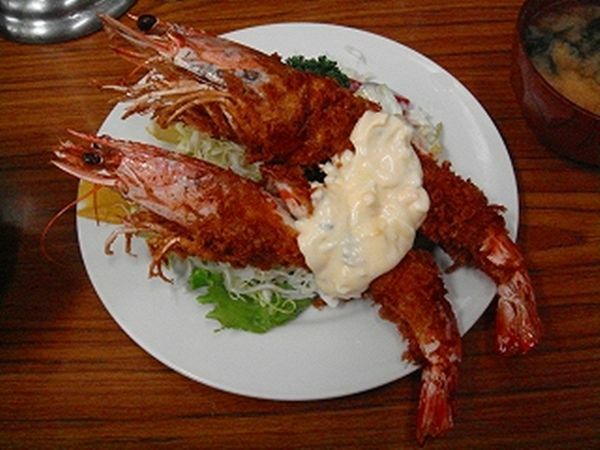 Once again, do try Dai Kuruma Ebi (large prawn) not the regular size one, if possible. Its the best.